Home » cash » Food n Beverage » offline contest » purchase » spend » Super » Peraduan SUPER Wang Senang Contest: Win Cash Prizes worth a total of RM100,000! 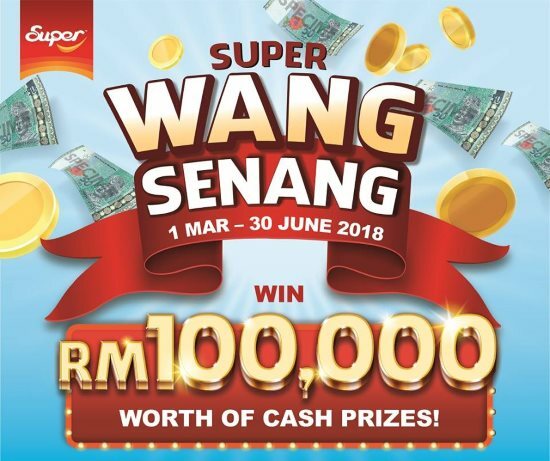 Peraduan SUPER Wang Senang Contest: Win Cash Prizes worth a total of RM100,000! BUY any SUPER product with the "Wang Senang" sticker. CHECK the contest card inside. If you receive a Winning Card, fill in your personal details. If you receive a Thank You Card, SUPER values your support. Try again by purchasing more SUPER products. (Admin: means you didn't win anything). Mail your Winning Card and original receipt to SUPER's office by 15 July 2018. Visit Peraduan SUPER Wang Senang contest page for more details.